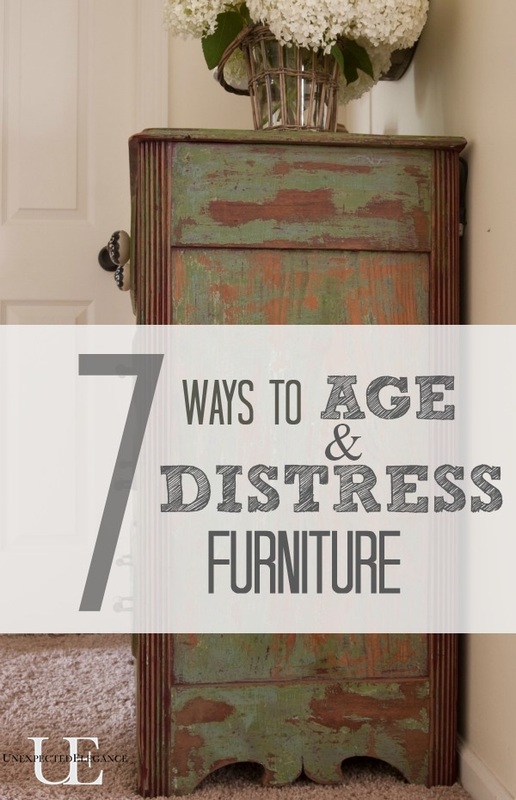 There a million different ways to age a piece a furniture. I have used probably a dozen different techniques and products to achieve my desired finishes, so today I thought I would share with you 7 ways that I age and distress furniture. This technique works if the piece has been repainted numerous times over the years. Using a paint stripper and wearing protective gear, generously apply the stripper over the entire piece and follow wait time on the instructions. Using a scraper remove the old paint. Depending on how many layers a piece has and the look you are trying to achieve, will determine if you need to do multiple layers of stripper. In my opinion this technique is one the easiest and requires the least amount of supplies. To do this technique you just want a very dry brush and lightly go over the surface. Keep some paper towels handy to wipe off excess paint when needed. For the cabinet in the picture below, I used some leftover latex paint from a bedroom we had painted. This is exactly how it sounds! You can use a sanding block, piece of sandpaper or hand sander, depending on how distressed you want the piece. The key to making it look authentic is to sand places that would have worn naturally over time, like near handles and edges. The piece in the picture below, I used a finer sandpaper with a hand sander. For this technique you add petroleum jelly over areas that would generally be worn naturally over time BEFORE you paint the final paint color. You will need to have a base coat in either a contrasting color or stain. Once you have paint over the Vaseline, let it dry completely then lightly sand over the areas. To add age to your paint, you can use a glaze or antiquing wax. This technique is all about working quickly. You want the product to go on easily and be able to remove most of it, with only a hint of the color left. This will give you the look of the paint turning color over time and naturally wearing. 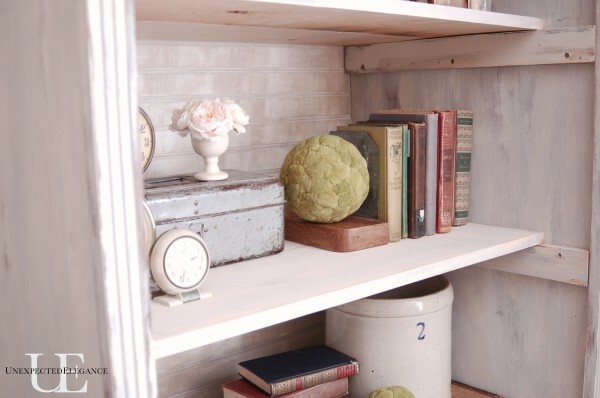 Here’s a good example and quick tutorial for using Annie Sloan paint with the dark wax: sincerely, sara d.
This is more of a product than a technique. I’ve learned that you don’t really want to be a perfectionist when using this paint. The more you “slop” it on the the better it looks…in my opinion. This is a bookcase that I used two different colors of Chalk Paint and lightly sanded. Angela – What a helpful post. I love the different distressing techniques! 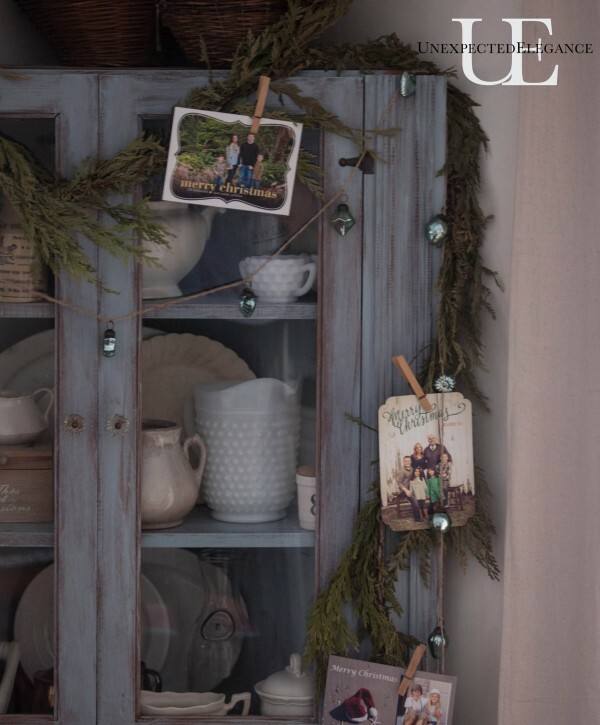 Thanks so much for featuring my chalk paint tutorial. I really appreciate it! Thanks for the great tips Angela. People are always asking these types of questions, especially when buying rustic or reclaimed wood from us. Now we can point them to some tips. Thanks for this post! 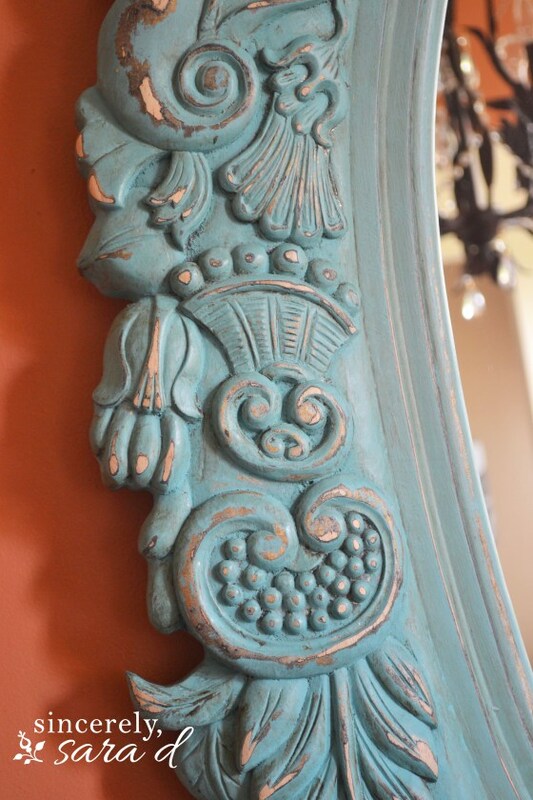 I’ve used Annie Sloan paint and love it. I also want to use the dry brushing — we just moved into our Blue Cottage and have so much paint left over. Recently i bought some vintage pieces of furniture and i think your tips will sure be good on them . Very soon i will try these . Thank you for these ways of distress furniture . Great descriptions and very helpful. I am thinking of combining the Vaseline and dry brush on a mirror frame. Do you think this would work? I love the green paint on the chest. Do you remember the brand and color name or number? Thank you for the simple explanations. Now I know exactly which way to go. So easy to follow. Love your site! 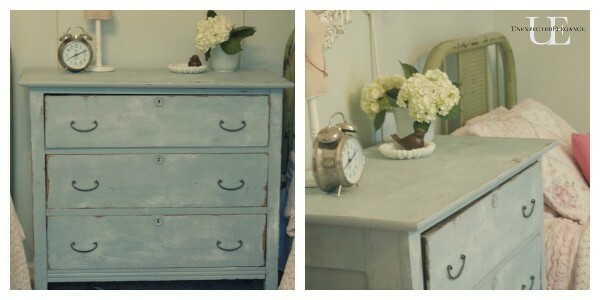 I recently learned about chalk paint & I make my own. I’ve done my China Cabinet & now I am working or the rest of the dining room set. I’ve done ok, I shouldn’t of started with such a big project. 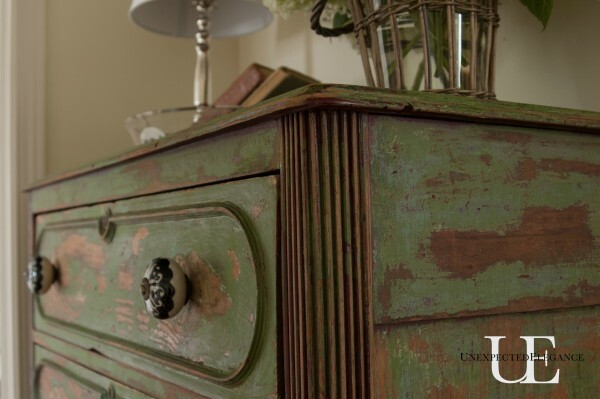 Do you coat/protect your chalk paint projects that aren’t distressed? I have hard time with the water based poly & I didn’t know if you had any suggestions. Thanks again for sharing your skills. I am trying to do most I can in the house that they look distress is so beautiful. in NC is so difficult to find anything that is affordable. Angela, Thanks for your post on mud/chalk paint it is very helpful. I plan on doing this to my pub table. Is there a finishing step to seal the chalk paint & wax for a piece that is used as a dining room table? Becky, since a dining table will get wet and whipped often, if you are using the chalk paint on the top I would lightly sand it in-between coats with a very fine grit sandpaper. The light sanding will help protect the finish but you might also want to try spraying it with something heavier? I would just spot check it before doing the entire thing. I have two distressed white nightstands that are just a little too off white to match the new distressed white iron bed frame we just bought. The bed frame is a bright distressed white with charcoal specks throughout. Since the nightstands don’t have any other color painted on them can I just paint them with a bright white paint and then hand sand them with a brillo pad to get the distressed look again. Just thinking that since it’s going to be a fresh coat of bright white paint over an off white this might be the simplest way for me to paint them. Should I use flat paint? Yes, I think that would work! If you are going to use a latex paint, I would try to get the flat that wipes easily. I’m not sure what brand it is, but you can talk to someone at the paint or hardware store and they should be able to help. Also, if I want to have the charcoal specks on the 2 nightstands would I first paint the nightstands with a charcoal color paint and then paint white over them and then just hand sand them with a brillo? Yes, you would need the charcoal under the white coat. It wouldn’t be speckled, but look more distressed with the darker color peeking through. I would suggest using a sanding block over a brillo pad, though. I love the colors on the blue cabinet that you dry brushed do you have any idea what colors you used and was it chain paint? Thanks so much. Hi Sara, thank you for such great tips! I am learning new distressing methods. Now about the (DRY BRUSHING) Technique, could you please tell me if you stained the wood first and then applied a coat of latex paint? What type of “DRY BRUSH” are you referring to, is it a regular paint brush? If so once you star using it I assume it wont’s stay dry, can you explain or provide a quick video about this beautiful technique? I would love to learn more about it. 🙂 Thank you!! Do you think dry brushing would work for a kitchen table? Would I sand 1st and then dry brush? Yes, it will work for your table but the top will probably need some type of finishing coat-like a poly. There’s no need to sand before you do this technique unless the paint isn’t sticking. Good luck, hope it turns out great!